At Filament Games, we don’t simply make learning games – rather, we strive to create memorable game-based learning experiences that result in lasting, real-world impact. Accordingly, we routinely work with real-world educators to conduct classroom studies in an effort to deepen our understanding of the subject matter efficacy of our games. 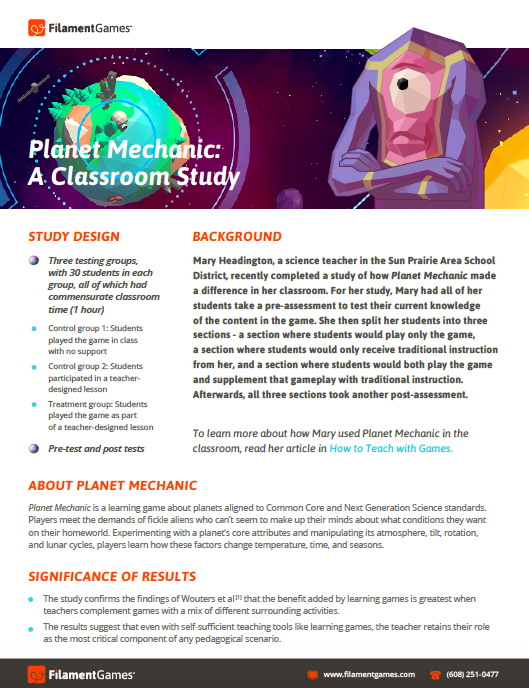 One such study – completed in conjunction with Mary Headington, science educator at a local middle school – attempted to measure the learning gains of in-class implementation of our popular Earth-sun-moon system game Planet Mechanic. In summary, the study found that the learning gains from educational game play is optimized when educators blend in-class game-based learning with a mix of different surrounding activities – mirroring the results of previous learning game efficacy studies. We invite you to explore the full results of the study at the link below. Want to learn more about how educational video games can support engagement and learning efficacy? Check out the informative video below from popular YouTube channel ExtraCredits, and don’t hesitate to reach out to us with any questions – think of us as your go-to game-based learning experts!